Dasuquin® for Cats. 84 sprinkle capsules. Ensuring feline joint health needn’t be a difficult, time-consuming or cost-prohibitive endeavor. Trust your cat’s joint care to only the most experienced experts. Dasuquin® for cats, a glucosamine supplement for cats, delivers the ultimate in cartilage production for your feline friends. Delicious and natural chicken and tuna flavors, plus a simple-to-administer capsule mean that your pet’s care is simple and pain-free — for both cat and owner alike. The science behind the solution is simple, too. Ingredients glucosamine and chondroitin sulfate help aid cartilage production and arrest enzymes that contribute to cartilage breakdown. 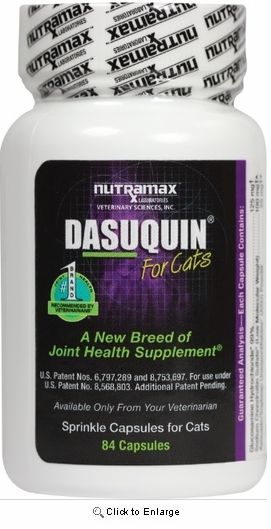 Dasuquin® is a joint supplement for cats. 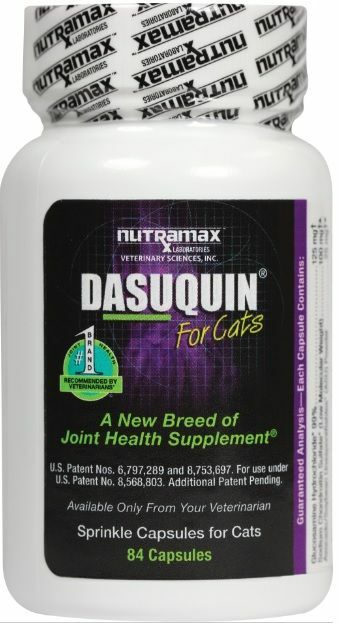 Dasuquin® for Cats is a joint health supplement that goes above and beyond other glucosamine supplements on the market. It is the most complete joint support supplement available. Dasuquin® for Cats contains the trademarked ingredients FCHG49® Glucosamine, TRH122® Sodium Chondroitin Sulfate, and NMX1000® Avocado/Soybean Unsaponifiables. It's available in a tasty, easy to administer capsule with natural chicken and tuna flavors. Dasuquin® for Cats capsules may be given once or twice a day depending on your cat's feeding schedule. Once desired response is obtained, capsules may be administered every other day to maintain your cat. Number of capsules administered may be increased at any time depending on your cat's needs. A maintenance level can also be used long-term on healthy cats to help support their joints. If your cat eats dry food, the food may be moistened with a small amount of water so that the powder sticks. Alternatively, the contents of the capsules may be mixed with a small amount (i.e., tablespoon) of wet or moist food to ensure your cat eats the entire amount. Capsules may be "pilled" if more convenient. Bottle contains 84 sprinkle capsules.